Don’t know what to get a teen in your life? That’s why I’m here! I’ve done a lot of research finding fun gizmos to give teenagers, so you don’t have to. This is a list of fun educational gifts and gadgets suitable for younger and older teens. Tech gadgets are cool for teenagers of all genders, but if you’re looking for a gift for a teen who isn’t that close to you (a coworker’s kid, or a more distant relative) or for an occasion that doesn’t warrant a big, expensive gift, it may not be appropriate to spend the money required for a tablet or digital camera. Among these gifts, on the other hand, you’ll find all the flare and intellectual stimulation of a fancier, more expensive gadget at a fraction of the price. Not all of these items fall into the gadget category: most of them are more accurately described as toys or joke gifts, but they’re all inspired by a love of gadgets and learning. Whether you’re looking for something really stimulating and challenging, like a 3D labyrinth game or puzzle, or something fun and simple like joke pens or a desk-hologram, I can guarantee all the items in this list will appeal to brainy teenagers. The toys and gadgets below are organized by price: under $10, under $20, and under $50, so you if you don’t see what you’re looking for right away, scroll down and you might find something better. The 3-D Miroscope creates a hologram of any small object you put in the center. There’s also a larger ‘deluxe’ model. Both older and younger teens will find the Miroscope incredibly entertaining as a novelty. It’s especially fun to create a hologram of a coin or other object and then laugh as friends try to pick it up. Even adults have a lot of fun with this. The Miroscope comes with a tiny frog, but you can also use coins, paper clips and other objects. These pens make great stocking stuffers for your nerdy teen, and they come in several different versions. Pens that look like syringes can be used for playacting or pranks, and are a fun gift for a teen who wants to go into medicine. Other joke pens include pens with floating eyeballs and brains, pens with a sand timer (for when they’re bored in class), and even a pen that is also a stylus, a laser and a UV light. Seriously. Does it get more geeky than that? COOL! These make a fun gag-gift for your yukky-loving teen. These bandages cover a hurt without your teen having to feel like a sissy. Yes, it works on adults, too! And if you have a teen going on a trip or heading off to college, a funny pack of band-aids like this one will ensure they have some first aid with them without you seeming too overprotective. You’ll find that bacon isn’t the only theme these come in either. All right, this is not really a gadget, but it’s certainly a fun survival guide for geeks of any age, especially with all the zombie movies and TV Shows that have taken off in the last few years. It’s written by Max Fields, who also wrote the incredibly successful book World War Z (later turned into a movie starring Brad Pitt), so you know he knows what he’s talking about. Teens will love flipping through the chapters and seeing how they measure up on the zombie apocalypse preparedness scale. The book also provides ample opportunity for fun arguments among friends, such as, “What would you rather have in the zombie apocalypse: a motorcycle or a truck?” and “What’s your preferred weapon?” I guarantee you that most teen geeks will get a kick out of it. Putty for teens you ask? Sure! It’s gross, which means it’s a great way for teens to tease each other (especially for the guys who don’t now how to talk to girls yet). I picked the glow-in-the-dark putty for effect. Don’t you love that color? However, teens of both genders will have fun with putty because there’s such an endless number of shapes, colors and types. There’s colorless putty, putty that responds to magnets (sold as “thinking putty”), etc. Lots of fun to be had with this stuff that’s somewhere between fluid and solid. Does your teen want to go to college? This may just be the gag gift to have a laugh and look forward to that lack of privacy combined with freedom. A Diversion Safe keeps valuables safe from thievery simply through distraction and psychology. When we see a soda can, we think it contains something to drink. Even a thief who knows these fake cans exist will still assume it’s a normal soda can. Because 9 times out of 10, they would be right. It makes the perfect hide-away for small valuable items. Apparently, the art of DNA extraction has come to the point where it can be done at home. I do think that’s very cool. Aside from a DNA extraction kit, this kit also includes parts for a model DNA molecule as well as a chromosome puzzle. This gift is great for the serious geek, or perhaps the kid who just can’t get excited about biology and needs that little push. All in all there are 18 activities in the booklet accompanying the DNA Kit. It’s designed for kids 8 years and up, but is still very fun for teens, especially younger teens, and can be a fun group activity. You might think puzzles are for kids, but 3D puzzles bring your classic jigsaw puzzle to a whole new level. You can get 3D puzzles of globes, model buildings, ships, and even life-size skulls, resulting in tough puzzles for geeks that give a result worthy of any sitting room. 3D puzzles tend to be challenging, fun and a real talking piece. Any puzzling teen will enjoy this exciting project, and they’ll appreciate the gorgeous and interesting final result. If you know your teen’s interests, get a puzzle that fits with them; like a model cathedral for a teen into architecture, or a pirate ship for a teen who is into pirates or fantasy. 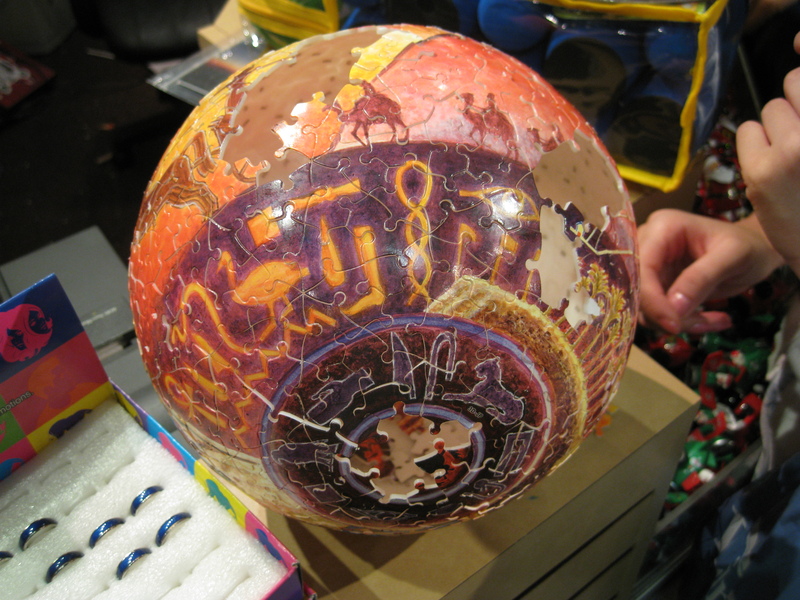 If you don’t know a teen’s interests, a globe is pretty much always a good bet. Accoutrements has created various versions of this ball, but the classic one is still the most popular. The Instant Excuse Ball is similar to a Magic 8 Ball, but instead of answers it gives you various excuses. The excuses are a great mix of cliche and absurdity, with examples running from “Jury duty” to “The dog ate it.” This is not the gift to give a kid as anything other than a joke. You’re sending the message: hey, want an excuse, at least be creative! Of course it could be the kind of gadget to help you talk to your teen about making excuses instead of taking responsibility. But most importantly, it’s fun and a great way for you and your teen to make fun of each other. Windup toys have a very long history. Often considered the earliest robots, windup and clockwork figures have been around forever. Today, they feature heavily in Steampunk and Victorian Era science fiction. They are both fun to play with and educational for a teen who wants to explore how they work. Kikkerland has created a whole series of such toys with a modern fun twist. This one has legs of various shapes and sizes, which will make it hop about unpredictably. Part of the “Critter family,” these toys are loosely inspired by insects; however, the engineers did not let the insect-theme limit them. They’re very imaginative creations and a lot of fun. Did you ever play that game Labyrinth, where you had to turn knobs on the side of a box to guide a marble through a maze? 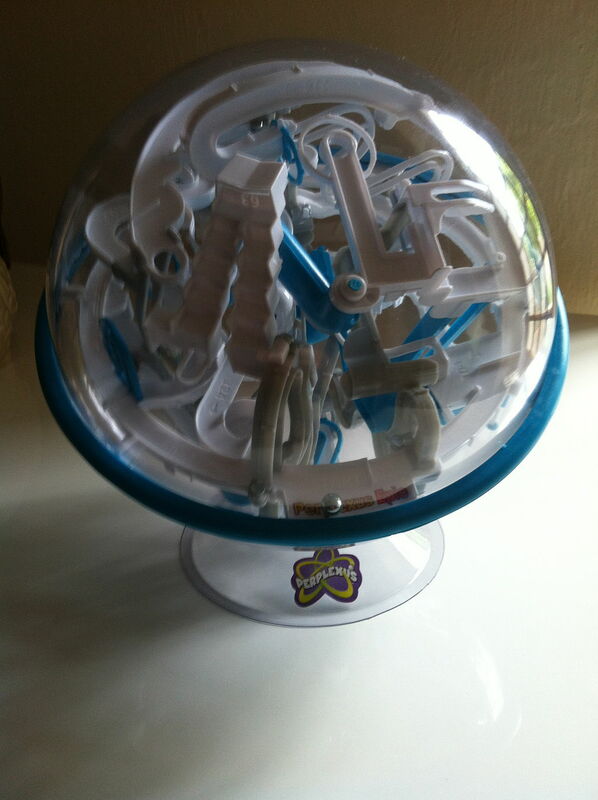 Perplexus Epic is the grown up version of this game if it were made by aliens. It’s pretty awesome and incredibly hard, and because there are so many parts to this maze, you can keep trying it for a long time without getting bored. Basically, you have to guide the marble through a three-dimensional maze contained inside the sphere. You can flip, twist and turn the sphere to move the marble past obstacles. It seems easy to do, but solving this game is surprisingly difficult. This is a great puzzle for the road; it comes all in one piece, so no pieces will be lost. Is your teen always losing their keys? Give them a key-finder gadget! It will appeal to their geeky side, yet it’s also practical. This key-finder comes with two colored key rings and a mini remote control buzzer with two buttons; one for each ring. You can attach the key rings to your keys or even your wallet, and then if you lose them you just hit the appropriate button and they start ringing away! If your absent-minded teen has ever wished they could call their lost keys like they can call their phone, this is definitely the right gift. Most teens love music, and let’s face it, as adults in their lives we are usually pretty unqualified to give them music. After all, who uses CDs anymore, anyway? On the other hand, headphones are a great gift because most teens don’t have good quality headphones, and a pair of good quality headphones will help a teen further appreciate the music they already have. Not to mention, they’ll have more privacy and won’t bother their parents by playing loud music, and they’ll be able to wear them everywhere and listen to music on the bus. There’s nothing cooler right now than these noise-reducing Bluetooth-enabled wireless headphones, which your teen can wear around without having to deal with wire getting tangled or caught in things. They come in a variety of fun colors and fold up for easy travel. These high-quality headphones are a great value for the money—the perfect gift for your music-loving geek. Gadgets, Gizmos, Toys, and Games: What’s Your Opinion? Now that you’ve checked out my top gadgets and games for teens, let me know what you think in the comments! Has this article been useful to you? If you’ve played with any of these objects or given them as a gift, tell us about your experience! Love your picks. I’ve seen a lot of great novelty gift items but never the bacon band aids. They’re a hoot!